These activities are based on maths usually encountered in primary school at UK Key Stage 1 (ages 5 to 7) and Key Stage 2 (ages 7 to 11). Can you plan routes for the Olympic Torch to visit these cities? How far will it travel? How long will it take? This activity gives children the opportunity to calculate using distance and time and is aimed at Key Stage 2 primary school pupils. Can you throw a beanbag as far as the Olympic hammer or discus throwers? This activity introduces children to informal measures to compare distances, and is designed to be accessible to primary pupils at Key Stage 1. As excitement mounts ahead of the start of the London 2012 Olympic and Paralympic Games, take a look back at the opening ceremony for the 2008 Games in Beijing. What shapes and patterns can you see? This activity is aimed at young primary school children at KS1. Who won in these different events? This is a more challenging activity for primary pupils at Key Stage 1, which helps children understand why sometimes the winner has the biggest number and sometimes the smallest. How do you compare to these results from Olympic Games in the past if you try similar running and jumping activities? This activity uses the history of the Olympic Games to introduce ideas about measuring time and distances in standard units, and is designed to be accessible to primary pupils at Key Stage 2. 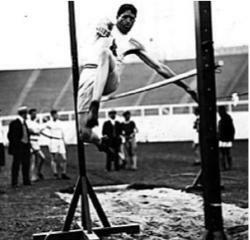 Look at the changes in results on some of the athletics track events at the Olympic Games in 1908 and 1948. What will the results be in 2012? This slightly more challenging activity encourages children to examine data and consider different kinds of influencing factors, and is designed to be accessible to primary pupils at Key Stage 2.
Who could have won the gold, silver and bronze medals? This activity is designed to be accessible to primary pupils at Key Stage 1. What events are there in your school sports day, and in the Olympic Games? What are your favourite races and sports? This activity encourages discussion and decisions about how to collect and display data, and is designed to be accessible to primary pupils at Key Stage 2. During the Olympic and Paralympic Games many national flags will be on display. This activity explores 2D shapes, angles and symmetries in the context of flag designs, and is designed to be accessible to primary pupils at Key Stage 2.